Today marks the 112th anniversary of the Great 1906 San Francisco Earthquake, a magnitude-7.9, which still ranks as one of “the most significant of all time,” according to the U.S. Geological Survey. While more than 200 miles away, Humboldt County also shook that day with enough force to cause significant damage in the area. It was 5:12 a.m. when the ground first trembled with a foreshock that was almost immediately followed by the main quake, described by USGS as “violent shocks punctuated the strong shaking which lasted some 45 to 60 seconds.” A nearly 300-mile section of the San Andres Fault let loose, stretching all the way up to the triple junction at Cape Mendocino. An estimated 700 to 3,000 people died due to the temblor — both directly and indirectly — with another 250,000 left homeless. One of the destroyed buildings housed the foundry with a large bronze work of President William McKinley that had been commissioned as a gift to the city of Arcata by local farmer George Zehndner. The first major work by renowned sculptor Haig Patigian, the artist thought the statue had been destroyed, but somehow it survived, reportedly pulled from the ashes by workers who has been following its creation. A few months later, the sculpture arrived in Humboldt County by boat and was dedicated to the city during a Fourth of July celebration. Whether he will continue to stand center stage is now unclear. 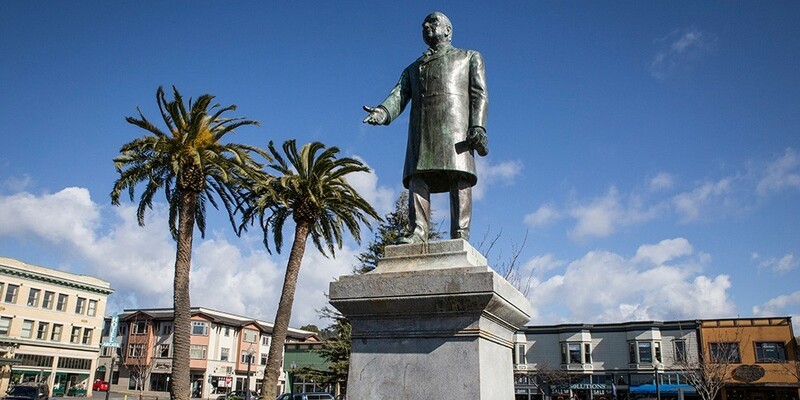 The Arcata City Council voted in February to remove the bronze work from the center of town, a controversial decision that has caught the attention of conservative commentators, including Karl Rove and Tucker Carlson, after the Los Angeles Times wrote about the issue. In response to the council’s decision, two Arcata residents — David LaRue and Stanton Reynolds — filed paperwork to bring the matter to a vote. They are now in the processing of collecting the 961 signatures needed to land on the November ballot. He is, shall we say, once again on shaky ground.